Sacre bleu! In recent weeks, while defending the government’s superannuation policy in the media, Scott Morrison has morphed from a future prime minister into a dogmatic zealot. Meanwhile in Canberra an under-the-carpet consultation process has begun. Coalition MPs are being canvassed by the party hierarchy about the superannuation “reforms” in an attempt to gauge the level of support or resistance before the changes are put to the house. Will MPs vote for the policy or cross the floor and vote against it? The only MP who said he would cross the floor, George Christensen, has been made a whip, so does that mean he has been bought off? And if the superannuation policy does pass the lower house, will some sage operators in the Senate threaten to block the Australian Building and Construction Commission bill and force the government to change the policy anyway, and thus make a fool of the wimps who voted for it? These are the important questions of our time. Typically, among Liberal MPs courage seems to be in short supply. Apart from one exception, who floored me by asking, “Why should we tax people less just because they’re old?”, every MP I spoke with thinks the policy is appalling and must be immediately sunk — by someone else. Meanwhile, looking on is the base: the Liberal rank and file, the members, the donors and the volunteers. Here is where fury and despair remain widespread. Policymakers needn’t panic, this is not about the desire to avoid tax. Everyone knows half the households in this country are addicted to their welfare — er, “transfer payments” — and someone has to pay for that. Out there in the real world, among half of us at least, there is acceptance we are compelled to work to fund the necessities of life, such as family tax benefits to the middle class, corporate welfare, politicians’ entitlements, education industry rorts, childcare scams and the installation of squat toilets in the Australian Taxation Offices. The only fly in the ointment is that the Coalition’s superannuation policy is terrible. Labor’s superannuation policy is better. I am told that before the election, cabinet waved the policy through simply because nobody understood it and time constraints were pressing. Indeed, the policy is complex, contradictory and bizarre. There is a cap of $1.6 million, yet hardly anyone is allowed to get to that cap unless they inherit wealth or something like that. Most MPs don’t understand their own policy, let alone where it came from — a publicly funded left-wing think tank, the Grattan Institute. Its report Super Tax Targeting is sexist and ageist. It urges the government to take money off “rich old men” who don’t need it and are committing “intergenerational theft” anyway via their superannuation accounts. 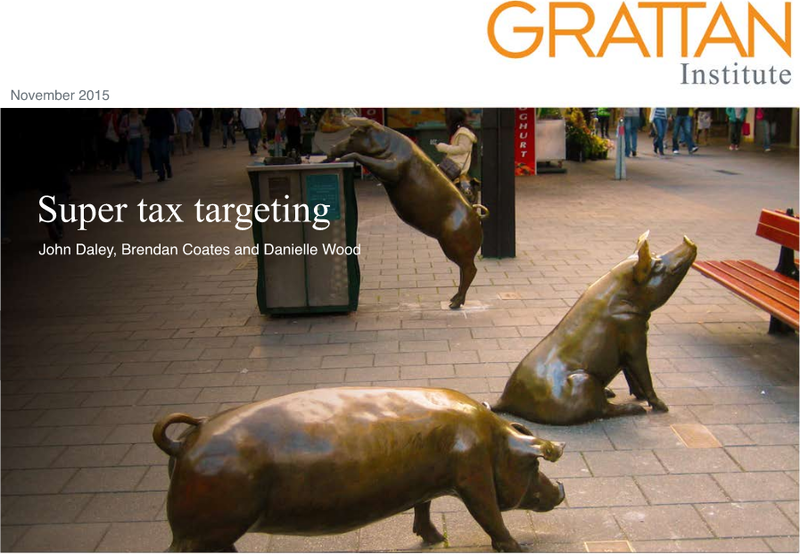 Further, self-funded retirees should be aware the authors of the report — John Daley, Brendan Coates and Danielle Wood — regard them as greedy pigs. Look at the report’s cover, pictured below.